According to the latest dates provided by BT OpenReach the Batley exchange is currently not scheduled to be upgraded to super fast broadband. One must remember that unless you are connected to Virgin all Internet providers are reliant upon the telephone cable from the customers premises to their local exchange. It is here that that the customer connects to the various Internet providers such as TalkTalk, Sky and others. This is despite other exchanges such as Morley, Cleckheaton, Dewsbury, Mirfield and Osset have already been upgraded or scheduled for late in 2012. Super Fast Broadband or “BT Infinity” as marketed by BT is where fibre optic cables are laid from the telephone exchange to the BT cabinets in your area. This is known as “Fibre to the Cabinet” or FTTC in some cases especially for business there may alo be the option of bringing fibre optic cable direct to your office. This is known as “Fibre to the Premises” or FTTP. In the past larger companies have had dedicated network connections to the Internet which can coat from hundreds to thousands of pounds per month. However with the advent of super fast broadband then small companies are able to utilise much faster internet connections at a minimal cost for a variety of purposes. This can vary from having phone lines over the Internet, to cloud based backups, or moving a company’s whole computing infrastructure into the cloud. 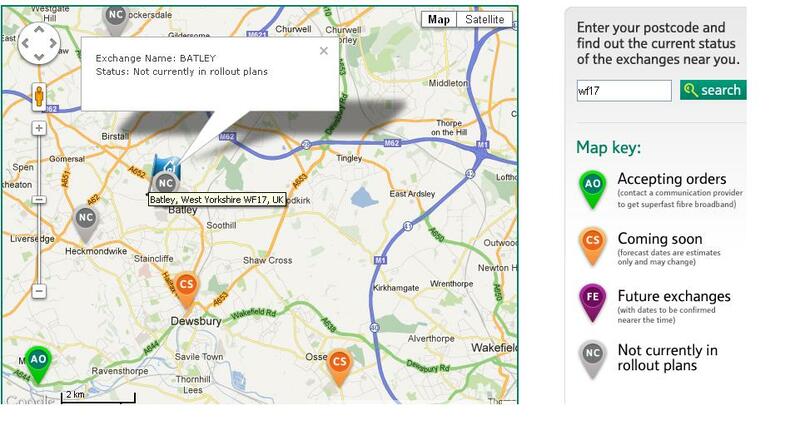 As Batley is not currently in the roll out program then it is impossible to tell when BT will get round to Batley. It could be years!!. Please take the speed test here which will then direct you to the BT Openreach page to register your interest. This will mean that Batley will be left behind in the technology stakes for years to come as businesses will prefer to be located in an area with fast internet speeds. This becomes even more important when you are located over a mile from the exchange as the speed will become lower. In Birstall, which is connected to the Batley exchange, it is rare for anyone to get a download speed of greater than 2MB. However there is one way you can help. By registering your interest with BT then they should take notice of the demand in the Batley area and hopefully put Batley in the rollout program. We are also interested in what are the current internet speeds in the area as they will vary from 5 Mbs down to 1MBs depending upon how far you are located from the exchange. We will publish the results on this site and by email before the end of October. This entry was posted on 14/09/2012 at 10:35 am. You can follow any responses to this entry through the RSS 2.0 feed. Both comments and pings are currently closed.